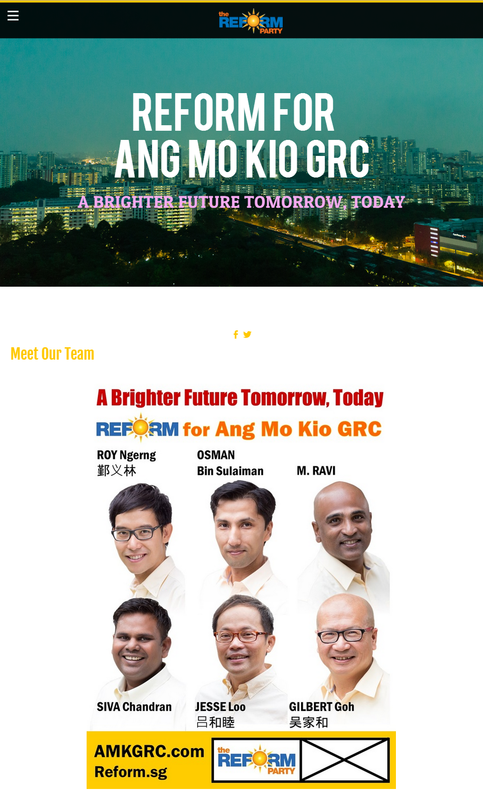 We have launched our Ang Mo Kio GRC campaign website for the Reform Party! You can get to know our candidates at the website, as well as to watch our campaign videos and view the photos that we have taken on our walkabouts. 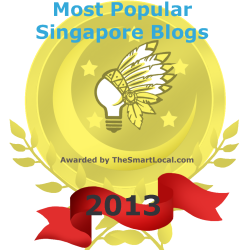 We also share with you more about what our candidates and the Reform Party want to do for Singaporeans. So, let’s get right into it! You can click on this link to go to our campaign website. Hi, just a question. About the policy that you mentioned: ‘Return Your CPF’, don’t you think that it will take a toll on our reserve with our ageing population? Would the large amount of money sg has be enough for everyone? Would it be dangerous if the money our government has become so little that there is not enough for improvements on infrastructure etc? Also, do you think that 55 will be an age too young for them to receive their CPF if they are going to? What if they squander their CPF on luxurious items and in the end the government would have to take care of them because they are citizens of sg? How would you prevent such incidents to happen? If there is an article on how your policy works, pls do link me to it as I am interested to find out more. If 55 is still too young to manage your own money, then what age is suitable? Dementia-age like lky at 90+? Many U.S. kids are already striking it out on their own as early as 17-18 to fund their college fees. No offence, but What does reaching 21 years old mean to you? Think at the end of the day when you finished up all ur savings. You will still turn to govt for help. What you willingly to sign now doesn’t matter. For survial, you are willingly to do what it takes. Do you think govt will just stand aside n not lending a helping hand? Think you r too naive. At the end of the day, the govt will still use taxpayers money to bail you out. Trust me. You know how church works? Get the volunteers to do the dirty work and that’s not all, they will pay and pay with their money while doing the leaders’ dirty work. This will be the last fight of Goliath vs David. David will throw his final punch at Goliath before his life will change to bankruptcy. Either this final punch knock out the Goliath, or the Goliath will crush David. Abvice from you ? 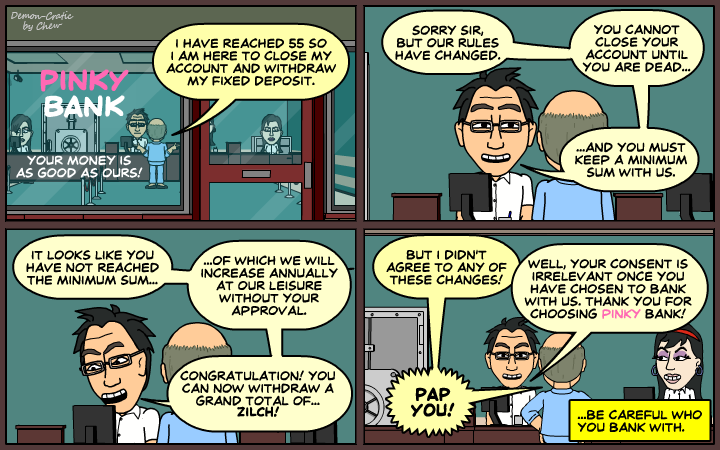 Should I with-draw or Opt-Out Retirement Account ? September 1, 2015 - 11:39 pm Return Our CPF $$$ & Regime Change!!! 1) Brilliant, Smart & Courageous RP Team! 2) U Deserve & Get Our Votes! a. Will U be singing e same song of tomorrow your good jobs & livelihood is gone? Replaced by cheaper FTs, FTrash, Fakers, PR, New citizens & Cheap Charly from PRC, India, Myanmae, Eastern European, Iranians & Pinoy Land? 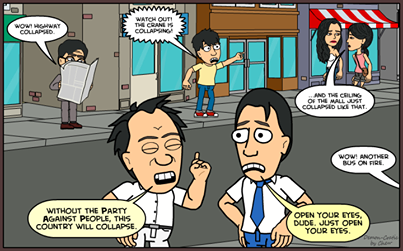 b. CPF Savings are Citizens Life-time savings or PAP-Govt Pension Fund? If U & both your parents face financial hardship, huge medical bills, jobless, loans, bills & mortgage to pay, How does CPF lock-up & $161K min sum help U? c) Where is e statistic & data to support e “false & exaggerated” Propaganda that majority of our Retirees squander All their CPF $$$ & become a “burden to Govt & Taxpayers? Why use “isolated” cases to Justify “draconian day-light-robbery” of Our CPF Savings WITHOUT Our consent & National Referandum to get legitimate n lawful Approval? d. Why allow yourself to be Rule by “FEAR”? e) Even if Uncle Sam, Ah Seng, Ahmad & Kumar squander & finish off their CPF $$$ @55, surely they can continue “working & support themselves” as Taxi drivers, Cleaners, Guards, Cooks, Dishwashers, Drivers, Tutor, Bus Captain etc? e) Why would foreign news disclosed that US$ 700 billion dollars in investments Lost by Temasek, GIC & GLC using our “reserves & CPF funds”??? f) How are these $$$ recoverable? g) Why do they give “peanuts” low interest earned to our CPF and pocketed e difference from actual nett profit? h) Why e need to bring in thousands of foreign PMEs to replace local PMEs still unemployed ? I) Why our overpriced HDB & Loan are used to “wipe-out” our CPF savings? m) Why High hospital bills are also used to wipe-out our CPF Saving? n) Why bring in thousands of foreign students to” flood” our Univ at e expense of our Local Students & Tax payer’s $$$? 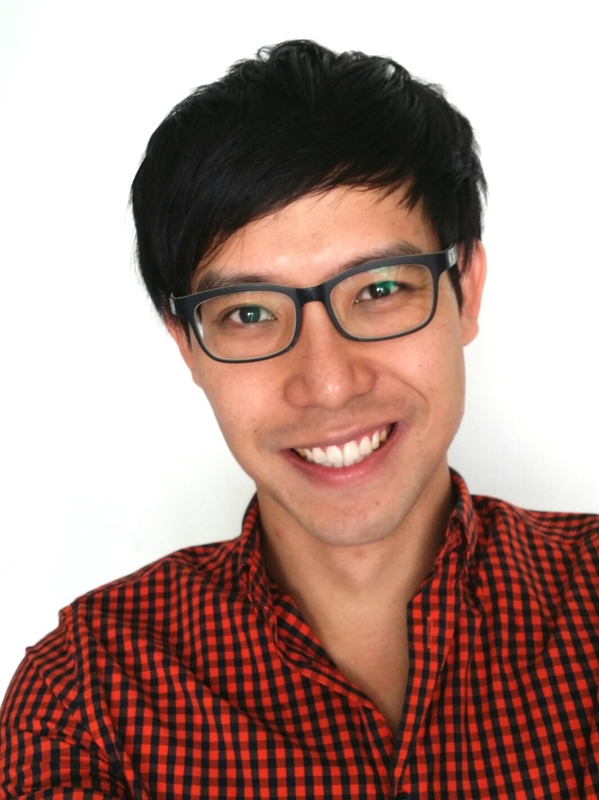 o) Why grant “fast-tract” PR & new citizens after their studies & hold PME jobs? Finally, what proven-track record do these PAPaya politicians have before 1965 when Our Founding Fathers & Pioneer Gen “believe & trusted” them with OUT VOTES? They we all just a mix bunch of Unionists, Nationalists, PMEs, Anti-colonialist & Political Gangsters! Know Your History & “Think About It Can”? Before voting…can ask…If point a gun to their heads, would they wet their pants? Or…they see many many money…eyes got big big? 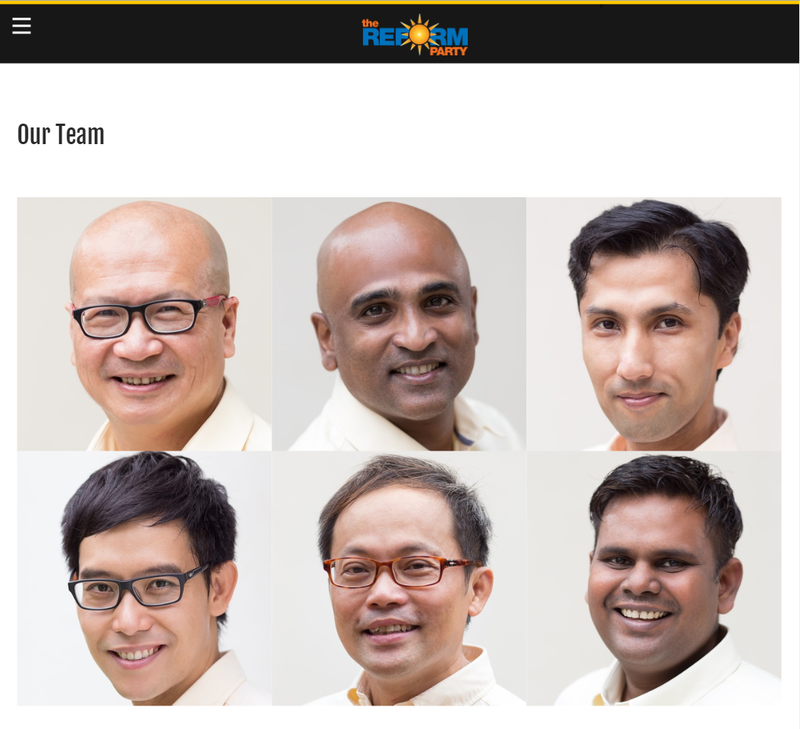 Vote for the Reform Party in Ang Mo Kio GRC. We Want to Fight for Your Future.